Russian citizens living in the country's easternmost regions of Kamchatka and Chukotka, began casting ballots to vote for the next president on Sunday. 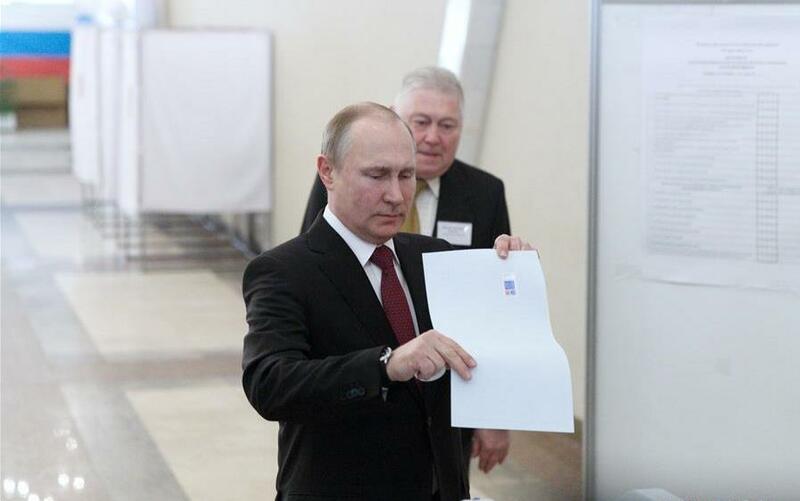 Incumbent Russian President Vladimir Putin votes at a polling station in Moscow, Russia, on March 18, 2018. Russia held presidential election on Sunday. As Russia's vast territory encompasses nine time zones, voting first began in its Far Eastern regions, including Kamchatka and Chukotka, at 8am local time (20:00 GMT Saturday), while voters in other parts of the Russian territory still have to wait for several hours to vote. Voters in Kaliningrad, the westmost exclave of Russia, will be the last to go to the polls, which will close at 8pm local time (1800 GMT) on Sunday. According to Ella Pamfilova, the head of the Russian Central Election Commission (CEC), some 110 million Russian citizens are eligible to vote, about 1.89 million of them live abroad. There are more than 97,000 domestic polling stations, and more than 400 overseas stations. The voting procedure will be monitored by about 1,500 international observers from 109 countries. The eight candidates running for the election are incumbent Russian President Vladimir Putin, who participates as an independent candidate, Vladimir Zhirinovsky from the Liberal Democratic Party of Russia (LDPR), and businessman Pavel Grudinin nominated by the Communist Party of the Russian Federation (CPRF). Other candidates include Grigory Yavlinsky from Yabloko party, leader of the Party of Growth Boris Titov, head of the Russian All-People Union Sergey Baburin, TV host Ksenia Sobchak and head of the Communists of Russia Maxim Suraikin. Two days before the voting day, Russian incumbent president Putin in a special address to voters called on Russian citizens to go to the polling stations and choose a president for the future of Russia. Under the constitution of the Russian Federation, the president shall be elected for a six-year term directly by eligible citizens. Any Russian citizen aged 35 years old and above, who has resided in Russia for no less than 10 years and does not hold citizenship or right of residence in another country, can be elected president.